A wide variety of unique Head wear for both men and women is the characteristic of the Spanish style in this century. Some follow the European styles, some exaggerate and elaborate on the European styles, and some follow the fashions of the Moorish south. Bernis and Menéndez-Pidal place the different styles of capiellos or tocas into six categories. 1. Cofia. The cofia (coif) is a fabric cap. Generally white and smooth, it could also be embroidered or transparent. In the tombs at Las Huelgas is found a cofia of parchment, one that is fabric with a linen lining and wool filling (embroidered with gold and silk), and one that is silk with a linen lining. 2. Cylindrical capiello. This style is seen on knights, kings, and some minstrels. The capiello of Ferdinand de la Cerda is made from a frame of linen and wood, and is decorated with embroidery, gold trim, precious stones, pearls, and coral. 3. Round capiello. This is a hat with a round crown and a turned up brim that is often a differnt color. This were usually made of leather and wool. According to Laws rom Toledo in 1364, bishops and priests couldn't wear capiellos made of silk, and the lining had to be black. 4. Boina (beret). The boina had a round crown, but no brim. Clergy, doctors, and standard bearers of military orders are distinguished by this style, with the addition of a "dented" crown. 5. Capirote. The capirote was a hood, covering the neck, and it was widely used throughout Europe. It could be buttoned in the front or the back, or merely slipped over the head. If it had an attached cape, it was termed sobretabardo. 6. Sombrero. The sombrero was any hat with a brim that gave shade, and it was worn by both men and women while traveling. Palm is mentioned as a construction material. Another hat that gave shade resembled the Chinese coolie hat; depictions usually show it in reference a story from/about the East, and it may not have been worn commonly. Note: There is certain amount of confusion that arises from the use of the word toca (tocado), now commonly understood as "hat". For example, in one of the Cantigas a woman embroiders a toca on the Sabbath; it is then used as an altar cloth. Alfonso X decreed that no woman should wear tocas bordered with gold, or silver, or with any color except white. In these instances the term is used in connection with a veil. Bernis and Menéndez-Pidal place the different styles of tocados into eight categories. 1. Circlet with loose hair. A band of ribbon, fabric, or metal in placed upon loose-flowing hair. Sometimes referred to as a garlanda, this style is seen on children and young girls. 2. Hair net. Nets are referred to as crespinas in later centuries, and had fabric underneath the net; we don't know the term used in this century. Hair nets are often worn with a fillet and a band around the chin (barboquejo). 3. Rectangular veils. These are often seen with striped and fringed edges. They are arranged in various ways. 4. Fillet. The fillet is a simple covered fabric frame placed on top of the head, but may also have an attached crown. One form of the fillet is a long band of crimped or ruched (rizado) fabric that is wrapped around the head several times to form the band. Fillets found a Huelgas are made of parchment, and a parchment frame covered with linen cloth. This style is often combined with a veil. The next categories of hats have come to be symbolic with high fashion in 13th century Spain. Continuing an evolution from the last century, they are characterized by coverings of fabrics pleated in complicated patterns. 5. Cylindrical, top larger than the bottom. 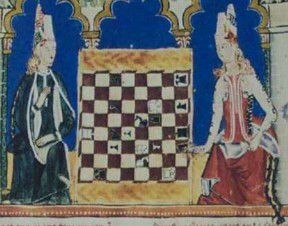 This style is not very common, and is seen mostly in the Book of Games. 6. Short cylinder. These usually have the addition of a chin band. There is evidence that the chin band could be attached by buttons and taken off for cleaning. 7. Tall cylinder plus horn. This style usually has additional decorative bands (often striped) on the hat, and also across the face. It is possible the face bands stem from the influence of Moorish face veils. 8. Tall cylinder. These could be embroidered, pleated, and topped with pearls, perhaps indicating royalty(? ), Hat and face bands are seen, as in category 7. It is probably that white linen was used for pleating and crimping. Much of the banding and veils are striped, but no extant fabric matches what we see in the manuscripts. There is mention of a striped called holol, which was woven in Almería. It is also possible that the stripes are applied ribbons; fine ribbons from Rocamadour are mentioned in a Gallegan troubador song. Although Moors are often depicted in bare feet, Christians always wear shoes. Some exceptions to this rule include boys, madmen, and men in occupations that required bare feet, such as threshers and sailors. Common materials for shoes were sheep, goat, sardon(?). Especially prized were leathers from the tanneries in Cordoba. Leather was dyed and gilded. 1. Abarcas. 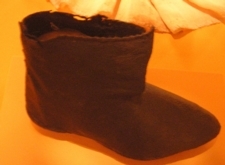 Abarcas are rustic footwear, and are characteristic of the Basque country. They consist of a piece of leather that is drawn up around the foot by means of laces, and are usually laced up the leg. 2. Suelas. These correspond to our modern day sandal. (These are not to be confused with sandalia, which are not sandals at all!) Suelas can have strips of fabric that cross the top of the foot, or those that go between the toes. They are usually seen on those in the lower clerical orders. 3. Zapatos/Çapatos. These are the common shoes, seen throughout Europe at this time. The leather is often pierced, giving an openwork effect. Although we aren't sure, it is assumed that at least some of these had attached soles, as was the case in shoes from other European countries. 4. 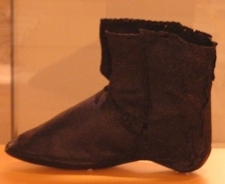 Zapatas. These are ankle-high boots. 5. Estivales. 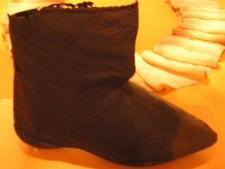 These are knee-high boots, similar to the old huesas. Because of their height, they were expensive and prized. 6. Sandalias and zuecos. These were a closed shoe with a platform sole, probably made of cork. The sandalia seems to be associated with the higher clergy. 7. Sanka/yanka. These are seen in the Book of Games, worn by women in the house. A low form of the chopine, it is supposed that they were made of wood. 8. Alcorques. This is probably the name of the high chopine.